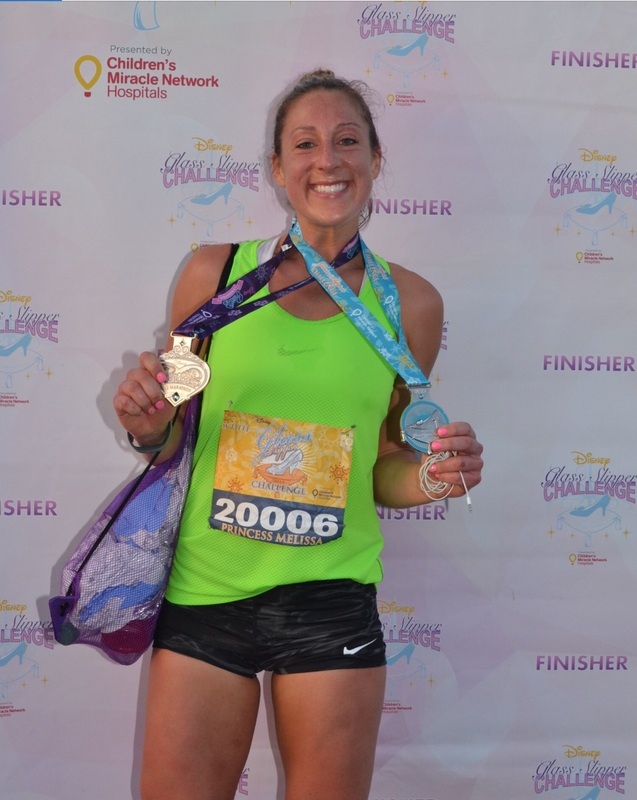 Initially, I planned on writing one giant Glass Slipper Challenge race weekend recap but as I was writing about the Enchanted 10k, I realized that each race is different and amazing in their own way. It just didn’t feel right to transition immediately into the Half Marathon after I ended a, what I thought was, a well written 10k recap. After the 10k, my legs felt shot. I was proud of my 3rd place finish so I tried to remind myself that my game plan was to race the 10k hard and see what I had left in me for the half marathon. Despite how annoyed I was with my legs not being very reliable, I was still on point with my game plan. But, let’s be honest. I knew that was a terrible game plan from the start because I have a difficult time admitting when I should back down and rest. Aside from some sun bathing and a short visit to Epcot, I spent a good portion of Saturday icing, rolling and living in my ProCompression socks…even if they DID NOT go with my outfit. Saturday was a whirlwind of emotions, there were moments when my legs felt great and I had a surge of confidence and then there were moments when they did not feel so great and the nerves started kicking in. 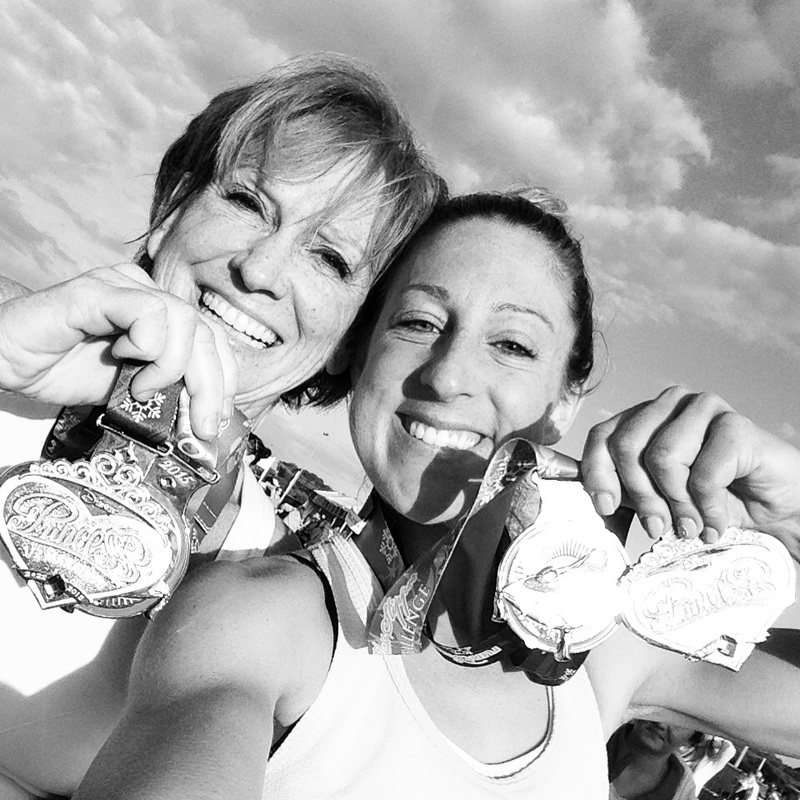 One thing that really calmed me down was a couple of women my Mom and I met while waiting for our seat at our pre-race pizza place. One lady was in a boot because she had tibia tendonitis but was still planning on running the half marathon. I jumped with joy, not because she was injured, but because I finally met someone who was experiencing similar issues. I asked her if she was worried about being able to finish. 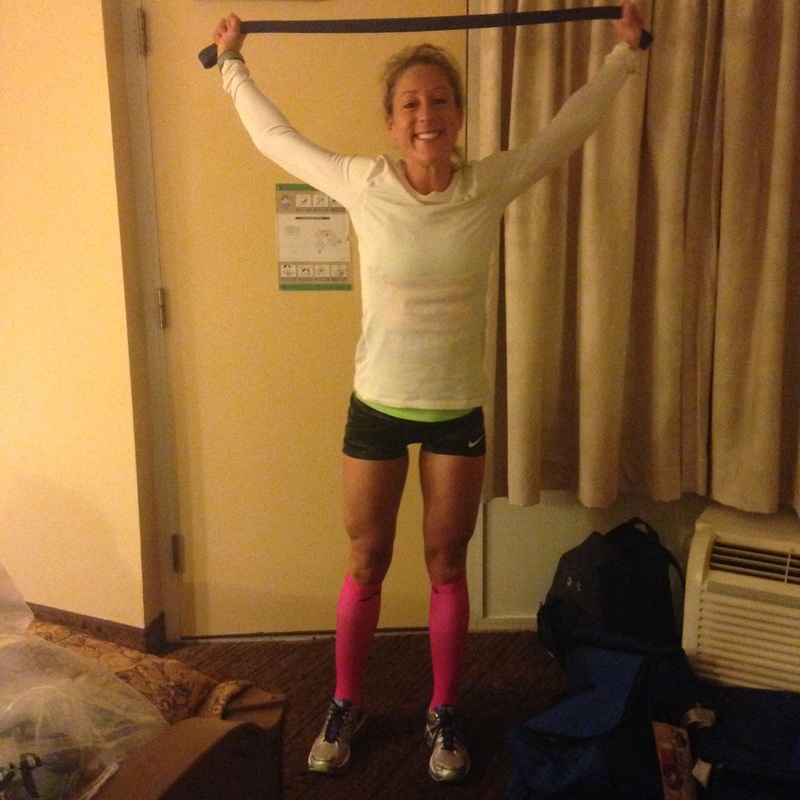 She was so confident with her answer, “No, I know I will finish it just won’t be fast”…so casual and confident even though she was walking in a boot less than 10 hours away from a half marathon!! And here I am, a little sore but no tibia pain..and im freaking out! Sometimes you just need to chat with other people to help you put everything in perspective. With another 2:45 wake-up call around the corner, it was an early night for us. Sunday morning looked very similar to Saturday…coffee, banana sandwiches, nerves and LOTS OF STRETCHING. In my opinion it was more of a ‘last minute attempt/plead for my legs to come back to life and not be sore’. 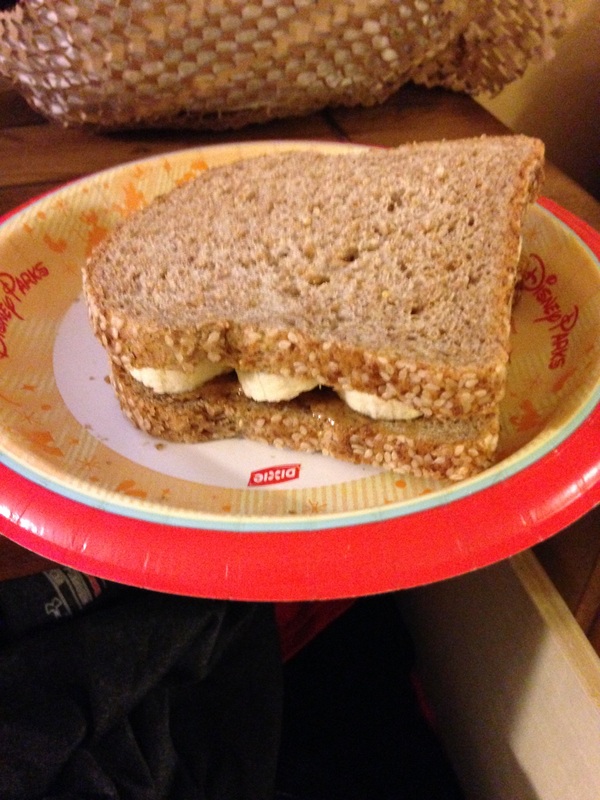 Funny story about my banana sandwich that did not happen on Saturday and was pretty unexpected. I am walking onto the bus holding my fine dining plate..
..and the bus driver says, “Ma’am please don’t bring food on the bus.”..now I understand that the majority of people are not runners and probably could not even tell you how long a 10k or half marathon is so I am used to the interesting comments, however, I am NOT going to just casually toss my breakfast in the trash and then go try to run 13.1 miles. Luckily, Disney does a great job hiring kind and enthusiastic employees so we were able to agree that as long as I take my empty plate off the bus, I could bring it on. Scarfing down a sandwich didn’t seem like a desirable or wise pre-race move. Even though I have done this race before, I forgot how long the walk is to the Elite Corral. Let’s just say, once the National Anthem starts playing, it is no longer a walk, it’s a run! I finally made it to the Elite corral and realized, wow that little run over here didn’t even hurt. Could it be that walking hurts more than running?! Well my friends, that was just the case. And now with a little confidence and a couple of minutes to spare before the start of the race, I managed to snap a picture of just how amazing this experience is aside from all the other nonsense that trickles through my crazy mind before a race. From the second I crossed the start line, I promised myself that I would just have fun. And that is exactly what I did. I kept a strong pace but I made sure to take in every moment. I just kept flying through the miles pain-free and comfortable. It felt amazing. I did not care about my pace, but I knew it was pretty darn decent. I did not care about my place, but I knew I was up front. I just ran MY race. I surprised myself with each mile. I truly was on cloud nine. I DID NOT expect to feel and do as good as I was doing. I remember at mile 6 saying to myself “you are doing amazing, keep it up, you have what it takes to finish this strong” I even surprised myself with that comment. I am always so hard on myself and my performances. I aim to be great at everything I try and rarely give myself enough credit for the small victories. At about mile 10 I started feeling my legs wanting to slow but my pride in what I had done thus far was enough to keep me moving. I passed some security men on bicycles and turned to them to let them know that I was ‘very jealous of their means of transportation’. I quickly put my ear buds back in so I did not catch their whole response but I did hear, “We are actually jealous of you…”. At the time I thought to myself, ‘they must be crazy. what in the world could they be jealous of? Being tired? Still have to run 3 more miles?’ Looking back on it now, I still don’t know why they were jealous but I do know that they were right, they should have been jealous. 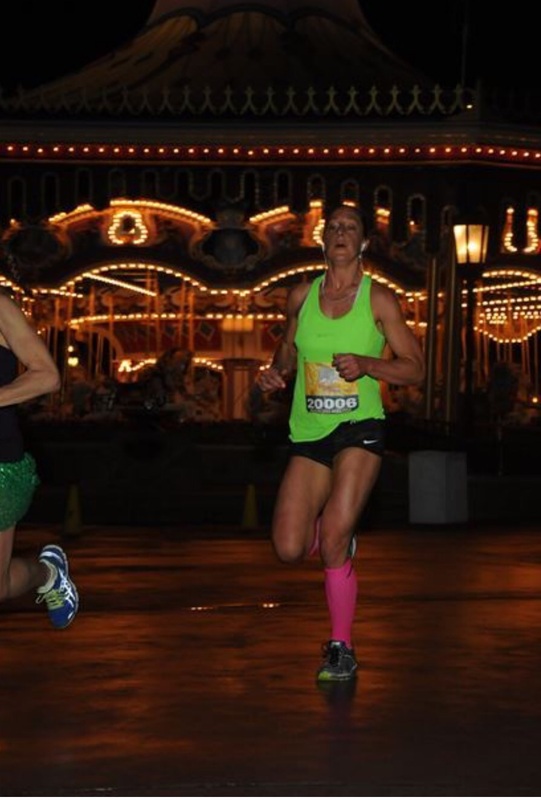 I was given the opportunity to run through Disney. I was just about to complete something I doubted only an hour prior. 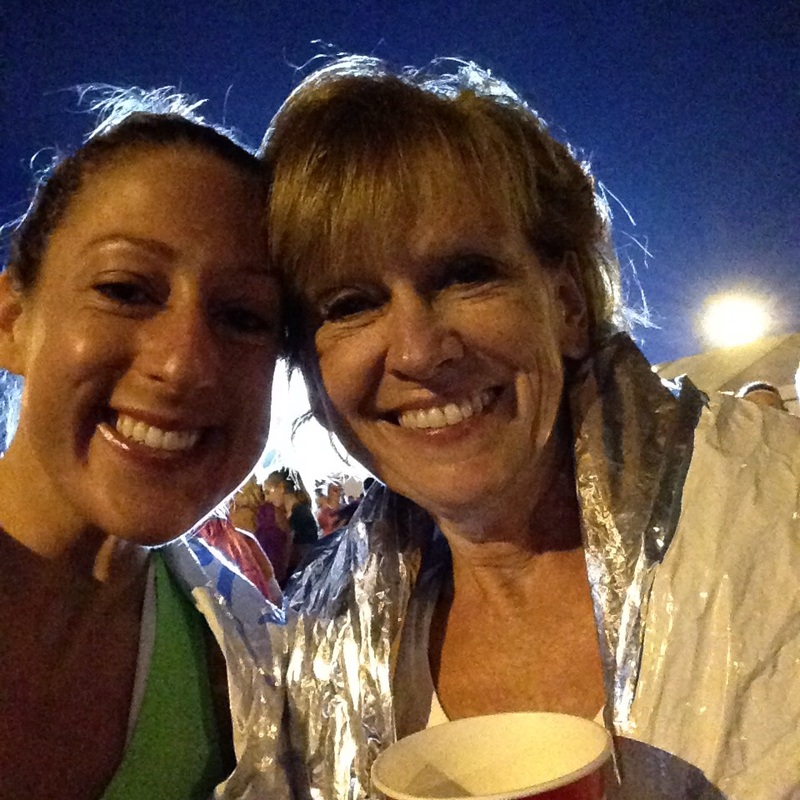 I had the ability to run 19.3 miles in two days. I had the ability to run. Yes. That is something to be jealous of. And something I should never take for granted. And with that ability, I trucked through the last 3 miles to finish an amazing weekend with some solid times and amazing memories. Scratch that. WE finished the weekend with some solid times and amazing memories. I can’t thank her enough for booking this trip, for running this challenge, and for just being such an amazing person. 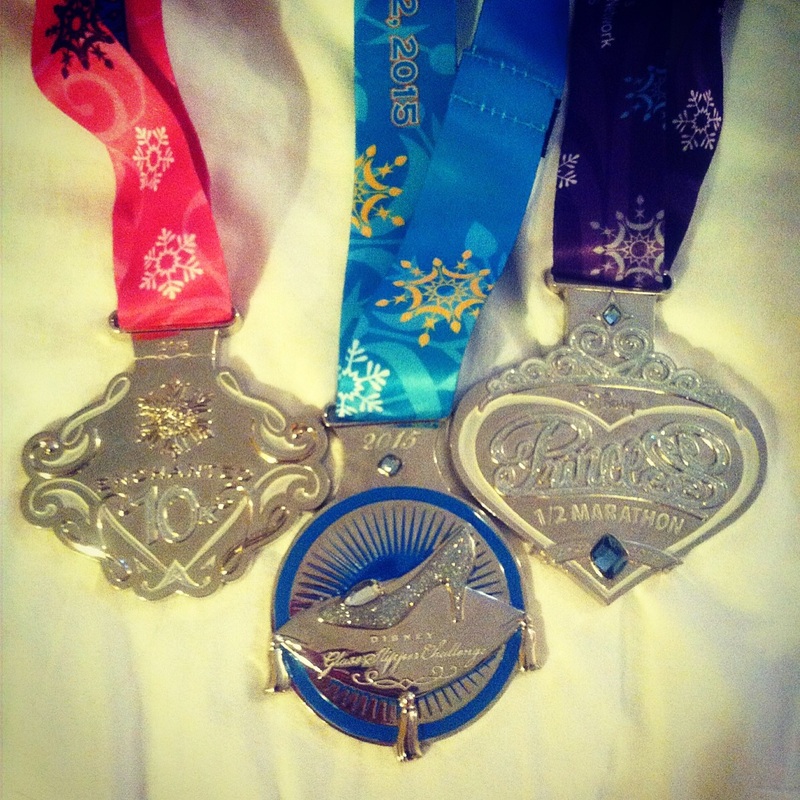 It is safe to say, we left Disney limping and with some pretty hefty bling. 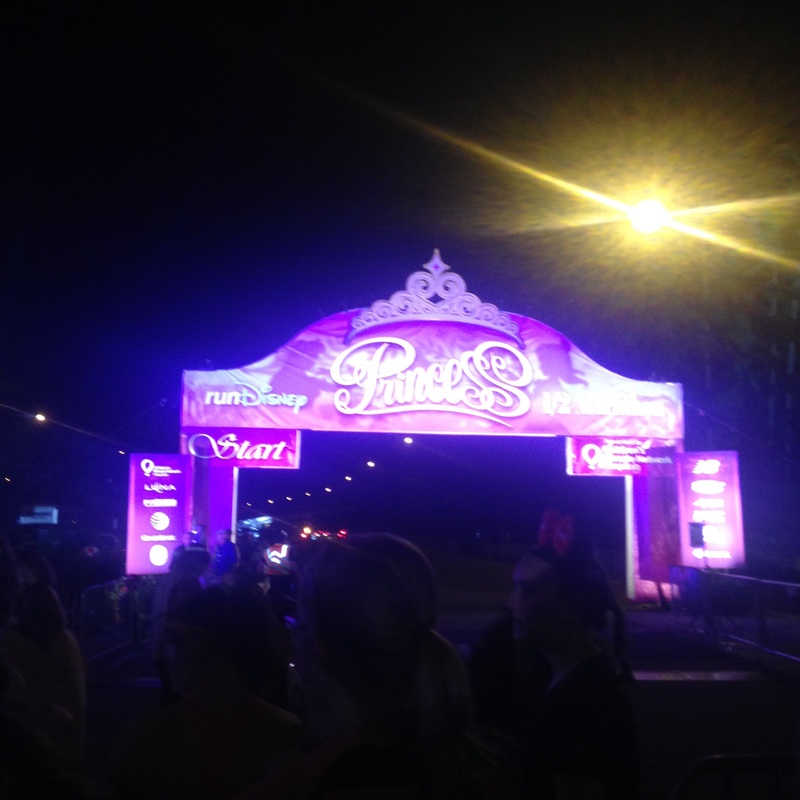 Previous postDisney Glass Slipper Challenge – 10k Recap!